The members of New Hope United Methodist Church believe the mission of the church is to make disciples of Jesus Christ by proclaiming the good news of God’s grace. We affirm that Jesus Christ is the Son of God, the Savior of the world, and the Lord of all. Jesus’ words in Matthew 28:19-20 provide the Church with our mission: “Go therefore and make disciples of all nations, baptizing them in the name of the Father and of the Son and of the Holy Spirit, and teaching them to obey everything that I have commanded you.” We believe that the Holy Spirit works in people’s lives and is experienced by accepting God’s grace and direction in one’s life. As members of the United Methodist Church, we affirm that God gifts and equips all believers for ministry to heal persons, heal relations, transform social structures and change the world. In order to be truly alive, we embrace Jesus’ mandate to make disciples of all peoples. Weekly worship services are a blend of traditional and contemporary music with emphasis on the proclamation of the Word. Casual attire is preferred by most, but more formal attire is always appropriate. Sermon on the Steps is offered to children of all ages during the morning worship service. Junior Church is offered for ages 4 through second grade following the Sermon on the Steps. Nursery services are provided for infants through age 4. Holy Communion, open to all, is celebrated on the first Sunday of every month. New Hope has its roots in the German Brethren tradition. 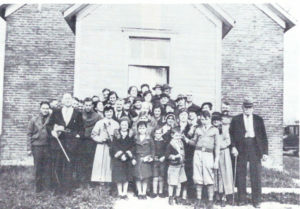 Members first met in homes until 1883 when the original church was built from bricks made on site across the road and was part of a 5-point charge. Morning services were conducted in German and evening services were conducted in English. In 1894 the church became affiliated with the United Brethren denomination, and with the merger of that denomination and the Evangelical Church in 1946 became New Hope EUB church. It was part of a two-point charge with the Lockington EUB Church. By the early 1950’s, the congregation was outgrowing its space and the possibility of building a new sanctuary, restrooms, and installing a new heating system were being discussed. In 1962 the new space was added and the mortgage burned in less than 5 years. Following the 1968 merger of the EUB and Methodist denominations, New Hope became part of a two-point charge with Hardin UMC. In March of 2003, New Hope became a single point charge. 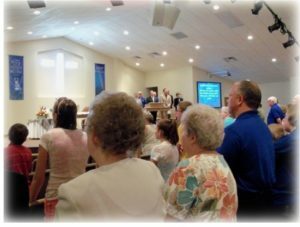 On October 25, 2009, ground was broken for the current building expansion for a new sanctuary, classrooms, nursery, office space, gathering area, restrooms and kitchen; the oldest portion that was the original sanctuary became the youth activity room and the 1962 addition became the fellowship hall. The additions were dedicated by Bishop Bruce Ough on July 11, 2010. The passage of scripture that guided the building campaign was taken from Psalm 102:18, “Let this be written for a future generation, that a people not yet created may praise the Lord.” The congregation is proud of its heritage of serving God for over 130 years, but our focus is clearly on the future. Our mission is “To make disciples of Jesus Christ and to bring hope, grace, and salvation to God’s people.” In response to God’s call, the vision of the congregation of New Hope is to help people discover Christ, so that they might be able to experience his grace, peace, and redeeming love, and then to prepare those called to be sent into the world to share God’s love with others.